Vertical polyethylene tanks are plastic storage containers designed for handling bulk quantities of water and chemicals. They are also known as heavy duty poly tanks, industrial storage tanks, chemical storage tanks, and bulk poly storage tanks. Protank’s vertical poly tanks are heavily utilized in the industrial, agricultural, commercial, wastewater, and manufacturing industries. Principal tank application is in the storage of water and chemicals such as acids, alkalis, some inorganics and organics, diesel exhaust fluids (DEF), and agricultural fertilizers, pesticides. Common chemicals stored within these poly tanks include: biodiesel, brine, calcium chloride, ferric chloride, ferric sulfate, ethyl alcohol, hydrochloric acid, sodium hydroxide, sodium hypochlorite, sulfuric acid, phosphoric acid, polymers, and urea. These vertical polyethylene tanks have long service lives and do not require maintenance. Bulk poly tanks are rotationally molded from high quality polyethylene resin. High density polyethylene (HDPE or HDLPE) tanks and cross linked polyethylene (XLPE) tanks are offered to suit individual storage requirements. Rotationally molded poly tanks are seamless, which produces a durable product that is resistant to tears, punctures, and impact. Plastic tanks are naturally resistant to rust and corrosion, given chemical compatibility. Most of Protank’s vertical tanks are made of FDA approved, food grade virgin polyethylene that is NSF 61 certified. UV inhibitors are added during manufacture to protect the plastic against sun damage. Vertical poly tanks are resilient to ranging temperatures and weather. The tanks are approved for full season indoor and outdoor applications. Protank offers heavy duty poly tanks in various dimensions and capacities. Nominal capacities range from 10 gallons to 20,000 gallons. The majority of tanks are offered with 1.5 to 1.9 specific gravity ratings. Some 1.35 and 2.0 SG rated tanks are also available. Standard features include offset fill wells, self-vented slosh-proof lids, base installed outlets, and graduated gallon indicators. Protank’s vertical polyethylene tanks are freestanding with flat bottoms. They include lifting lugs to provide maneuverability and tie down slots for tie down systems if necessary due to environmental concerns. The tanks are available in opaque colors, in white, black, yellow, and light blue. Opaque colors minimize sunlight exposure, helping to inhibit solution warming and the growth of algae if applicable. Yellow tanks are not manufactured of FDA certified food grade polyethylene resin and are not approved for potable water use. Protank’s chemical storage tanks can be customized per application need. Customization options are available for fittings, nozzles, welded flanges, welded couplings, PVC, CPVC, polypropylene bulkhead fittings, bolted fittings, heat tracing, insulation, ladder systems, internal and external down pipes, liquid level gauges, valves, and increased manway sizes. 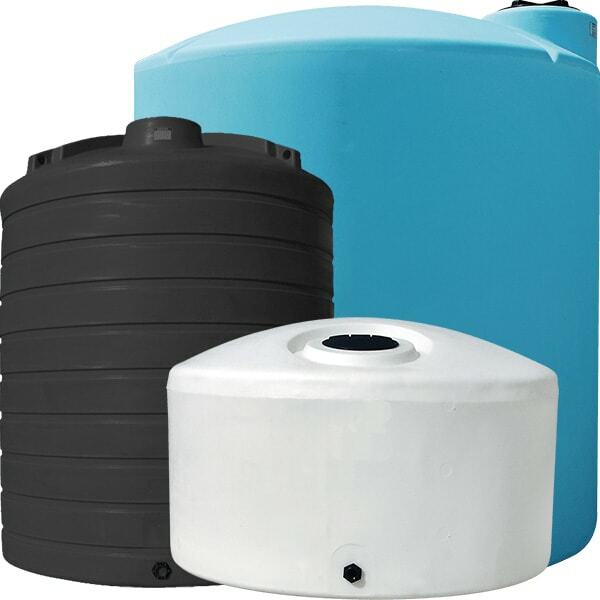 Three to five year manufacturer warranties are available for Protank’s vertical plastic tanks. Contact us for custom poly tank fabrication, chemical and material compatibility, or for more tank information. Our staff offers drawings and specifications for all of our plastic vertical tanks.